I LOVE every one of these easy recipes and they are all so different! This is the perfect option for your ‘meal prep’ day and it couldn’t really get much easier in terms of cooking ability and time efficiency. If you want to add some steamed fish or chicken to these dishes it will make the perfect accompaniment. Usually on one of my weekend days I’ll do my meal prep and it will usually entail making recipes such as these and cooking quinoa, freekeh, roasted vegetables, making nut milk (SO easy), hummus, kale pesto, prepping raw vegetables and salad leaves and I’ll take a bit longer if I want to prep some dishes that can be portioned up to go straight into the freezer (think curries, stews, soup, sweet potato mash, hummus, fresh fruit and so on). I would recommend writing a meal plan and shopping list for your meal prep and realistically I will prep fresh food for three days (minus things which will go off – avocado, prawns, tomatoes – I will chop/cook these fresh) and have a good stock of fresh freezer food for the following few days OR I’ll do a quick prep again for the 4th and 5th days. NO I don’t enjoy eating 5 day old food either! Preheat the oven to 160-180 degrees C.
Place the cherry tomatoes, cauliflower and sweet potato inside. de-stalk the beetroots and wrap in tin foil. Place into the dish or on another dish in the oven. Place into the oven for around 30 minutes or until golden. Turning/shaking occasionally. The beetroot may need another 10-15 minutes. Check with a fork and if it goes straight through quite easily it is cooked. 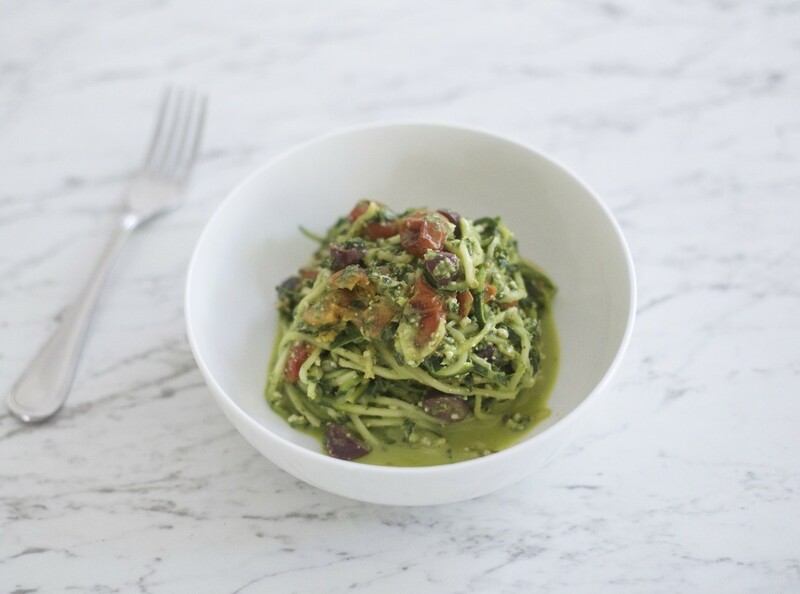 Place all of the ingredients for the kale pesto into a high speed blender, season to taste. Blend and leave to one side. If you can’t get hold of a spiraliser you can julienne your zucchini with a julienne peeler. Your kale pesto, tomato and olives will keep in the fridge for a few days. If you want to have a ‘fresh’ dish just spiralise/julienne your zucchini on the day and add the remaining ingredients from the fridge. You can warm this dish ever so slightly to take the chill off. Kale pesto is so fresh and zingy. Enjoy a tbsp with crudités or on top of a salad or soup. If you are really pressed for time feel free to buy a ready made pesto. However, try and find a vegan pesto containing no cheese and preferably one that is made fresh to keep preservatives at bay. Wash your Freekeh thoroughly. Place into a medium saucepan with 4 cups of water and a dash of Apple Cider Vinegar. Bring to the boil and then reduce to a simmer until cooked. Around 20 – 25 minutes. Drain any excess water and leave to one side in a large bowl. Dress with a dash of olive oil and the juice of a quarter of lemon. De-seed you pomegranate and prepare your kale and mint. For the dressing add half of the mint leaves and the remainder of the ingredients to a bowl and mix thoroughly. Season to taste. Add the rest of the mint to the freekeh, add the cauliflower, kale, pomegranate and pepitas, mix thoroughly. If you want to enjoy this dish warm I would be inclined to leave the pomegranate out and sprinkle on top afterwards. If you are eating a day or two later feel free to prepare your kale and herbs on the day and add to the dish and the yoghurt then. If the coconut yoghurt gets to hard, warm for 10-20 seconds. This would be a great side dish with steamed or grilled fish such as Salmon. First make the dressing. Add all the ingredients into a high speed blender and blend. Leave to one side. Add the salad ingredients into a big bowl and cover with dressing when you are ready to eat it. If you are eating in 2 or more days time leave your dressing to one side until you are ready to eat. 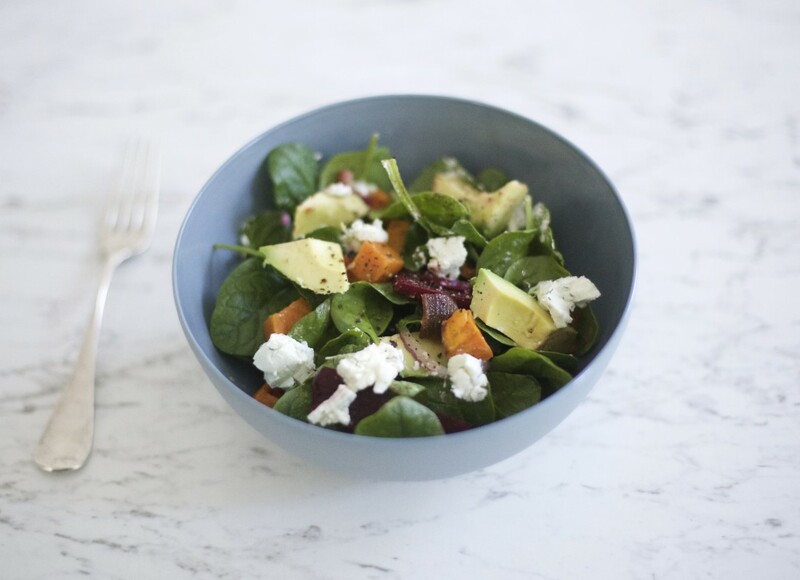 Also if you are eating in 2 or more days time keep your ingredients separate to ensure that your spinach is still nice and crunchy…..the sweet potato will be slightly oily from roasting and will wilt the spinach. Prepare the avocado fresh on the day. Where do you find the containers?